This week feels like we have half a foot in the 1970s. Although colour won’t come to BBC-1 and ITV until November, all but two of the programmes I watched this week have been made in colour. The first series of On the Buses and Department S both feature, shows that I very much associate with the 1970s. One of the biggest changes compared to last year is the broadcasters. Having already waved goodbye to TWW a tad earlier, at the end of July 1968 ABC and Rediffusion were ushered out to form Thames Television and ATV also left London. In their places, Harlech entered Wales and the West, ATV took over the Midlands for seven days instead of five, and Granada similarly increased its days in the North West. With the North having been divided in two, Yorkshire came into, er, Yorkshire, and London was shared between Thames and the new London Weekend Television. I really love that the weekend split now begins on a Friday evening at 7pm. It seems appropriate as most people feel geared up for the weekend at that time. I’m sure LWT were keen on this too, as it meant they broadcast for three evenings a week instead of just two. This week my ITV programmes are coming from ATV, Border, Thames and LWT. I last watched David Attenborough in 1961. Since then he’s been to Australia and down the Zambezi river in Africa. But mostly, he’s been quite busy being the Controller of BBC-2 and this year becomes Director of Programmes at the BBC. I don’t know much about Bali so was looking forward to this documentary. If you’re one of the lucky people watching in colour this evening, you’re in for a real treat. Tonight’s episode shows numerous rituals and ceremonies, many of which use magnificent costumes and decorations. You do have to be incredibly fortunate though as in 1968 only 75,000 colour television licences were sold. The price of both the sets and the licence must have put plenty off; a monochrome licence cost £6 [£105 in 2018, allowing for inflation] compared to £11 [£190] for a colour one. We first see a funeral and though this might seem odd, we are told that it is a celebration in Bali. They are lavish and I was shocked to be told that corpses may lie in shallow graves for years while families save up for the funeral. We are also shown two young girls being put into a trance so that gods may come and possess them. Probably the strangest event is two men becoming possessed by pigs. This is only performed in some of the most remote villages. With straw and other materials tied to them, they shuffle around on hands and feet. Men in a trance like this can “possess superhuman strength” and this is demonstrated when it comes to undo the trance, with several men being needed to hold the ‘pigs’ down. This short feature marks the two millionth Mini being rolled off the production line at the British Leyland factory at Longbridge in Birmingham. The Mini had revolutionised the small car market and sales galloped ahead as various stars from The Beatles to Twiggy were seen with them. Sir Alec Issigonis, who designed the Mini, is interviewed about his thinking behind the Mini as well as his thoughts for the future. He seems sceptical about a car smaller than the Mini but admits they are looking into it. The Italian Job was released a few weeks ago and the Mini is one of the stars . This must have had an impact as just two years later the original Mini would achieve its greatest ever sales at 318,475. Having never heard of this programme before, I decided to watch it based purely on its intriguing title. Robert Wagner plays Al, a former thief now employed by the government to put his skills to more positive uses. In this episode he’s been asked to make sure some important papers don’t get into the wrong hands. But as he finds himself dealing with a fellow criminal, he needs a cover so also steals a necklace. The titles are wonderful. They are full of images of luxury like casinos, of Al smooching with women, foreign locations – it’s very James Bond and I’d even say our rebellious Al is slightly cooler than 007. Al is a likeable, witty character and I warmed to him right away. He has an uneasy relationship with his superior, who holds the threat of sending Al back to prison over his head and these comments filled in a nice bit of background for this new viewer. Nick Grobbo is the fence Al finds himself crossing and he is played with utterly charming villainy by Ricardo Montalban, whose slight accent can be traced to his birthplace of Mexico. He has a beautiful voice and I could listen to him speak for hours. His henchman, Willy, is played by Richard Kiel, who must have conquered a line in such parts as this is a more refined role than that I saw him playing in The Man From U.N.C.L.E. in 1968. He wears a suit and generally acts more dignified while Nick makes threats against Al’s body. I really liked It Takes a Thief and upon looking him up, I’m delighted to discover that Montalban appears as Nick in another episode. I will definitely be watching another and hoping to discover a little more about Al’s past. I had seen an episode of LWT’s On the Buses before but I didn’t remember being too keen. I didn’t dislike it but I didn’t instantly love it either. I did, however, quite like this episode. There were a lot of characters to meet but as they could pretty much all be classed as Stan’s mother, aunt or something-in-law, I didn’t need to keep up with them. 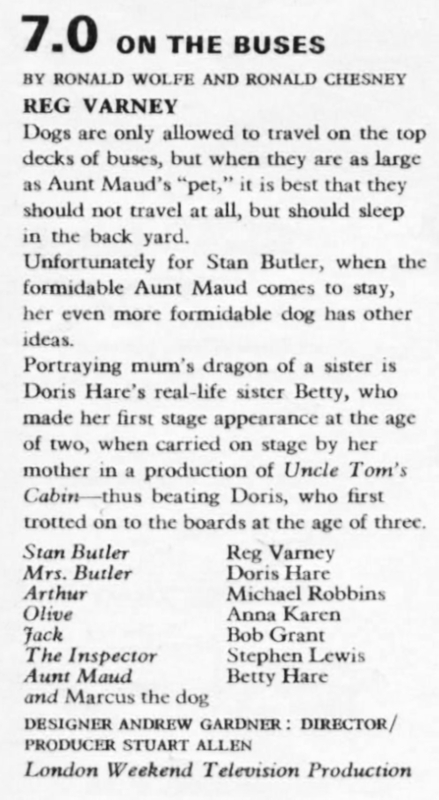 It’s the visit of Stan’s aunt, accompanied by her enormous dog, that upsets the house’s sleeping arrangements, leading to Stan attempting to share a bed with his brother-in-law, Arthur. With his freezing feet, he is less than ideal company. There are plenty of things that make this episode of its time. Auntie’s conversation with Stan’s mother stands out most though. Auntie is enquiring about Stan’s lack of a girlfriend and says, “He’s not gonna turn out like Uncle Herbert?” and when Stan’s mother explains this with a limp wrist it makes it quite clear. They never used to talk about this uncle – “But it’s alright now ’cause it’s legal.” But it isn’t alright, is it? Auntie could have asked, “Is he a bit…?” yet she wants reassurance that Stan isn’t. It’s ok perhaps, so long as it isn’t one of us. Their tones show that it isn’t. The fact that she won’t just come right out and say, “Is Stan by any chance one of those homosexuals?” shows that it really isn’t ok. But in all honesty, this is not what interests me about these programmes because it’s exactly what I expect from the period. Just like Arthur expecting the women to have his liver on the table when he gets in from work, I find it more remarkable that liver has definitely fallen out of favour as an evening meal. Michael Caine is someone I associate with London’s swinging sixties. David Bailey’s photographs of him are the first thing that come to mind and they epitomise cool as far as I’m concerned. With rising stars like Caine, having a regional accent would no longer be seen as such a disadvantage for actors. His profile has grown considerably by 1969 due to the success of films like Zulu, Alfie and the Harry Palmer films. The timing of this documentary is unlikely to be a mere coincidence because, as referenced above, his latest film, The Italian Job, came out a few weeks ago. The documentary follows Caine around, visiting some old haunts as well as seeing him just relax with some friends over a game of snooker. Part of it has a ‘look how far he’s come’ feel as we cut from the outside of his childhood terraced house to his current home, filled with artwork. He certainly conveys his appreciation of what he’s earned. 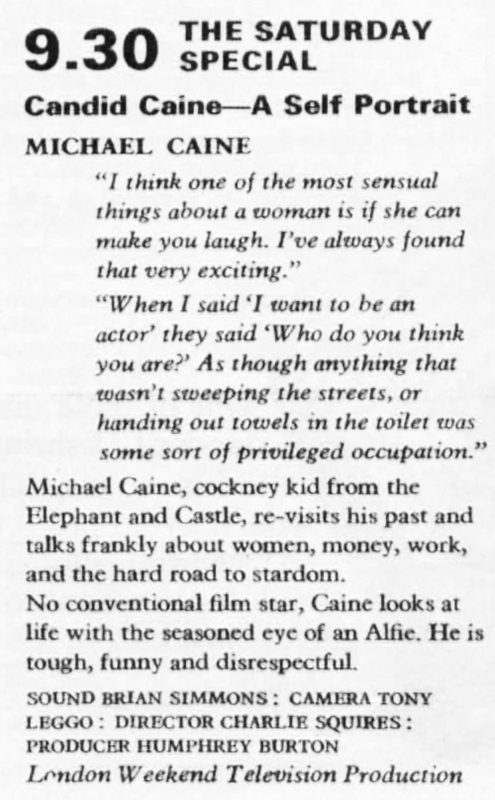 ﻿ In between this, Caine chats about various topics and he’s happy to move beyond just himself and his films. He compares cockneys with African Americans and black people in Britain. It’s incredibly strange to him use the word ‘negroes’. Mostly, I cringe at how old-fashioned it sounds being spoken so casually. It’s impossible to date exactly when words became unacceptable and my only reference for this is Richard Burton’s diaries. In October 1968 he writes ‘Sammy Davis Jun. told me […] that it was no longer considered kosher or ‘in’ to call Negroes Negroes but blacks’. Caine talks about how black people often have jobs like bus conductors or lavatory attendants and comments “Well, those are all the jobs that everybody’s father I knew did.” It was interesting as he compared the way both groups had been oppressed (by the Klu Klux Klan and the aristocracy respectively), told that this was the best they deserved, and was clearly something he felt strongly about. I had seen an episode of Department S spinoff Jason King, so was curious to see how this would compare. It’s far less over the top and camp than the later series, which I’d found great fun, though I enjoyed this too. A man is shot on a plane that is revealed to be a mock-up, with tape-recorded sounds being played out. He escapes and Department S are called in to investigate. I found this episode intriguing and quite gripping but by the end I felt like I’d missed something as I wasn’t sure what the plot’s conclusion was supposed to be. Nonetheless, Peter Wyngarde alone is enough to bring me back for more. UNKNOWN How – This children’s series shows you how to do all sorts of different things. For instance, this week you can learn how to lie on a bed of nails. I have dim memories of the revived version of this programme, titled How 2. MISSING The Bruce Forsyth Show – Every episode from this year’s series is missing. Just billed as Bruce Forsyth in this week’s issue of TVTimes, I believe you can never have enough Brucie and would love to see some of his show. This week’s guest is Sid James, which is all the more enticing. In fact, I’m keen on all the guests this series as they include Ronnie Corbett, Cilla Black, Edward Woodward and Harry Secombe. MISSING Opportunity Knocks! – It seems absurd that so little of this long-running talent show exists, especially as many later stars appeared on it. Hughie Greene is the presenter and his name has appeared several times in the schedules across the last few years so I would like to see some of his work. MISSING The Gnomes of Dulwich – I’ve seen Terry Scott and Hugh Lloyd in an episode of Hugh and I Spy and enjoyed them. Several of their comedy programmes are missing so it would be great to see any more. This sitcom is written by Jimmy Perry, best known for penning Dad’s Army. MISSING An Enemy of the State ‘Point of No Return’ – The BBC really got their use of this series before it was wiped. This is its first broadcast on BBC One after being transmitted on BBC Two three times previously. They were clearly sometimes struggling to make proper use of their newer channel as at one point the same episode was being shown on Saturday and Sunday nights each week. ‘Harry Sutton, about to fly to Russia to install one of his firm’s computers in a top-secret steel plant, is trapped into getting information for a man called Hendersort.’ As I like all things espionage-related, this series sounds fantastic. Of course, one of An Enemy of the State’s three BBC Two broadcasts was an in-week repeat. Unusually it gained this honour on its second (and third) broadcast, not its first (and second). I wonder if that had happened to any other series before.